About Alegro | Freiwilliges Engagement. Weltweit. 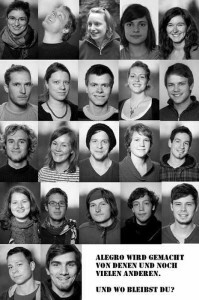 ALEGRO IS an organization based in Germany creating a network of engaged young people who are passionate about realizing social projects together. ALEGRO ORGANIZES volunteer services based on the “Weltwärts” program of the German Federal Ministry for Economic Cooperation and Development and the “Internationaler Jugendfreiwilligendienst” (IJFD). FURTHERMORE, ALEGRO carries out workshops in schools, cultural exchange activities, summer camps, networking seminars and sees itself as a Think Tank for innovative social ideas. Alegro e.V. encourages young people to engage in social issues in Germany, Europe, Africa and Latin America. We follow this goal by offering international volunteer programs with a special focus on development policy and the social impact of globalization. Our activities include the intercultural preparation of all participants before starting the program. We mentor them during their time abroad and provide space for reflection and evaluation after completing a year of living and working in a foreign country. It is important to ensure that the program brings benefits to both, our participants and to the projects with whom we cooperate. We select these projects very carefully, especially with regard to whether they can supply meaningful areas of engagement for our volunteers. Overall, we want to take a path towards taking social responsibility in a world that is constantly growing bigger and more connected. During the entire process of our volunteer program – from the application procedure to returnee activities – we promote civic engagement among young people. We maintain close contact to our volunteers throughout the year and after their participation in our program. Thus, we continuously support them individually in taking responsibility for shaping society. We take the idea of volunteer-service as an opportunity that gives young people interested in social issues a chance to grow individually and become responsible citizens in a globalized society. Alegro encourages volunteers to continue their commitment after their return. Many former participants decide to continue their participation within Alegro – e.g. as leaders in seminars, as volunteering mentors or as part of the organizing team. Through their involvement they can actively shape the direction of our commitment. We encourage them to take responsibilities in areas that allow them to pursue their interests, apply their talents and thus find self-efficacy. We want to show that many of the opportunities and social goods that are often taken for granted– including our volunteer program—in fact need motivated people, lots of perseverance, strong social networks, sustainable concepts and the effort of many individuals. In Alegro we aim for equal partnerships with sister organizations abroad and in Germany. We therefore actively include them in the process of applicant selection, stay in close contact throughout the year and exchange thoughts regarding future plans for the volunteer program. In Alegro we continuously reflect on how we structure our volunteer services and seek to reinvent these underlying patterns if appropriate. One result of this permanent process is our participation in the pilot period of a South-North Exchange program, which entails not only sending young people from the Global North to the Global South, but also vice versa. This has been made possible through funding by the Federal Ministry for Economic Cooperation and Development since 2014/15. By enabling young Ecuadorian people to carry out volunteer services in Germany, we have established a program that provides a more balanced exchange of cultures. We create spaces for encounters on different levels: within the group of participants from Ecuador and Germany, between the volunteers and the people they meet abroad and among the mentors of different cultural background in our seminars. Making the South-North volunteer program a new core activity of Alegro not only enriches our perspective on global learning. It is also a great chance for us to further increase the level of participation of our Ecuadorian partners structurally and strive towards reaching an equal level of involvement. in carrying out the North-South volunteer service in Germany, we strongly emphasize our regional roots in East Germany. We believe that, especially in the new German states, an intercultural exchange with people from the global South should be increasingly promoted. This would also help us reach new target groups in East Germany on the topic of development policy and encourage them to participate in upcoming volunteer cohorts.